Personalized Water Bottles make a great First Birthday Party Favor! We have so many label designs to choose from. Any of the colors or designs can be changed to complement your 1st Birthday Party Theme. Our water bottle labels are print on a commercial laser printer. We use premium high gloss paper, that will not smudge. If you plan on putting your bottles on ice, or in the fridge, we have waterproof water bottle labels that will not run. We have some great designs, but if you are looking for something else, we will design a one of a kind custom water bottle label for you FREE! Just email us at info@candyundercover.com or call us toll free at 877-235-2828 and we will work with you to create a fantastic Water Bottle Label just for you. 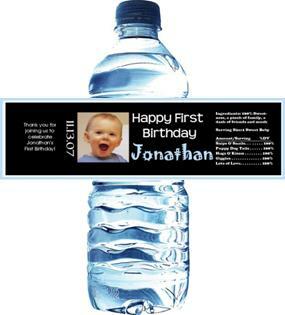 Photos can be added to any of our Water Bottle Labels also FREE!